Mikey Kudo receives the Fusion Loader, creates his own team (Fusion Fighters) and recruits some Digimon partners in the Digital World. There, he learns that Lord Bagramon is attempting to conquer the world by collecting 108 Code Crown fragments and wields the Darkness Loader. Mikey collects some fragments from each zones, but Bagramon steals them and recruits AxeKnightmon. Mikey, Angie Hinomoto and Jeremy Tsurugi are sent back to the human world, but Mikey returns to the Digital World, leaving his friends behind. When Bagramon creates an empire divided into seven kingdoms, Mikey, Christopher Aonuma and Nene Amano defeat each generals. They learn that Bagramon is using Ewan to oppose them, while they gathered negative energy from those which transformed fragments into a Dark Stone (D5). After Mikey saves Ewan and retrieves all fragments, Shoutmon defeats Bagramon and plans to bring peace to both worlds. Known as Digimon Fusion 2 outside Japan. One year later, Mikey discovers an unstable realm between both worlds and learns that Quartzmon is absorbing data. The DigiQuartz is where Digimon Hunters capture Digimon for leaving any world and feeding negative emotions on anyone. The Clock Store Owner unites all heroic characters from different parallel universes. Tagiru and Gumdramon wield Bagramon's lost arm "Brave Snatcher", in order to defeat Quartzmon. With both worlds restored, all humans and their partners are separately return to their own universe. The series ends with Mikey, Tagiru and their friends planning their future. Digimon Xros Wars was first publicly revealed in the June 2010 issue of Shueisha's V Jump magazine, including the name of the series and brief descriptions of the series and several main characters. It was directed by Tetsuya Endo and written by Riku Sanjo. Digimon Fusion received positive ratings in Japan. However, the third season was rushed, with Yukio Kaizawa as the main writer. In order to retain the series' popularity, Mikey Kudo remained as a returning character, while Christopher and Nene were removed from the main cast. Instead, Ewan remained as a protagonist due to his character still needing growth. The series was the first to be broadcast in widescreen 16:9 and in HD 1080i and aired on TV Asahi between July 6, 2010, and March 25, 2012. Crunchyroll began streaming the original Japanese version of the series outside of Japan, with English subtitles, in November 2011. Disney XD in Malaysia aired a William Winckler-produced English version along with original Chinese and Malay dubs based on the original Japanese version from December 8, 2012, titled Digimon Fusion Battles. The series was licensed by Saban Brands for an English language release to air in North America, contracting Studiopolis to dub the series into English and hiring Noam Kaniel (Noam) (who worked on X-Men, Code Lyoko, & Power Rangers,) to compose the music for the series. The series began airing on Nickelodeon on September 7, 2013, was moved to Nicktoons after three episodes, and later began airing on The CW's Vortexx programming block from January 25, 2014 to September 27, 2014. The first season became available for streaming on Netflix starting September 13, 2014, while the second season became available on March 8, 2016. In Latin America, the series began being broadcast on Cartoon Network in May 1, 2014. Beginning on February 24, 2014, Fusion began airing in the United Kingdom on CITV, the same channel that aired the first three seasons. In Canada, YTV, which aired previous installments of the franchise (barring Digimon Data Squad), began airing the series on February 28, 2014, with thirty episodes. The series was released on DVD with nineteen volumes by Bandai Visual in Japan from April 22, 2011 to August 24, 2012. A DVD box was released on November 22, 2016. Part I was released in the US on February 10, 2015 via Cinedigm, in Germany on June 15, 2015, and in the UK in via ITV Studios Home Entertainment. In Australia, Part I was released in several volumes from June 11, 2014.Part II was released in the US on March 1, 2016 via Cinedigm. Kousuke Yamashita composed the music for the series. A total of three CD soundtracks under the label of Music Code were released in Japan on September 29, 2010, March 23, 2011 and January 18, 2012. A manga adaptation of the series by Yuki Nakashima began serialisation in Shueisha's V Jump magazine from June 21, 2010, featuring several major plot differences from the anime. The manga consists of twenty-one chapters in four volumes. The last one was released on March 21, 2012. Two arcade machines, Digimon X Arena (デジモンクロスアリーナ, Dejimon Kurosu Arīna) and Super Digicard Battle (超デジカ大戦, Sūpā Dejika Taisen), have been released, which utilise special cards. A video game based on the series, Digimon Story: Super Xros Wars (デジモンストーリー超クロスウォーズ, Dejimon Sutōrī Sūpā Kurosu Wōzu), was released in Red and Blue versions for the Nintendo DS on March 3, 2011. Together, Super Xros Wars serves as the fourth game in the Digimon Story series. Bandai released a series of card games in North America. On its Japanese premiere, Digimon Fusion had a rating of 4.1 viewers. Digimon Xros Wars: The Boy Hunters Who Leapt Through Time was nominated for the 2012 International Emmy Kids Awards for "Best Animation". Famicom Tsūshin scored Digimon Story: Super Xros Wars 32 out of 40. Early responses by Anime News Network praised the pilot, stating nostalgic Digimon fans would enjoy it based on its new approach to power-ups within the main cast and compared it to the highly acclaimed mecha series Gurren Lagann despite suffering from cliches often seen in other anime. Voice actor Kyle Hebert said he enjoyed working in the English dub of the series as his two characters, Dorulumon and Balistamon, offered diverse characterization. Fellow actor Ben Diskin shared similar feelings, commenting he had been a fan of Fusion ever since its Japanese premiere and thus was glad to be voicing both Shoutmon and Cutemon, another pair of characters whose personalities differ greatly. General critical reception has also been positive. 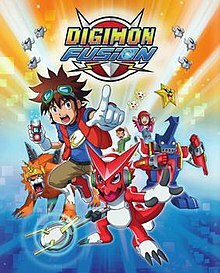 Mediaverum enjoyed the early episodes from Fusion and recommended it to fans of both the first two Digimon Adventure series. While noting the series was aimed at a young audience, DVDCorner wrote that the series still had deep themes which might attract older viewers despite its flaws. ICv2 recommended the series for a young audience when checking the English DVDs. CulturedVultures left it up to the viewers to watch it or not, also recommending it to an audience that has knowledge of the franchise, while Metro stated it retained the appeal of its predecessors which overshadowed the famous Pokémon back in the 1990s. DVDTalk found mixed feelings when reviewing Fusion. While he lamented the series' focus on Digimons rather than humans, he still praised the show for its animation and recommended it to fans of the series. Capsule Monster commented that despite the apparent attempts of the series to expand marketing, Fusion offers an appealing story, as rather than focusing on friendship, it also contains dark themes rarely seen in children's shows which might attract other audiences. ^ Digimon Fusion 2 is the official title of the third season of Digimon Xros Wars outside Japan. ^ a b Clancy, Michelle (October 17, 2013). "ITV to broadcast Digimon Fusion anime in 2014". Rapid TV News. Archived from the original on December 30, 2018. Retrieved December 30, 2018. ^ "Digimon Fusion Battles premiere". Youtube.com. Archived from the original on 2014-01-30. Retrieved 2014-02-21. ^ Dickson, Jeremy (October 18, 2013). "ITV licenses Digimon Fusion". Kidscreen. Brunico Communications Ltd. Archived from the original on October 20, 2013. Retrieved October 20, 2013. ^ a b "Nickelodeon dives into Digimon | News". C21Media. 2013-09-20. Archived from the original on 2013-04-16. Retrieved 2014-01-28. ^ a b Dorich, Alan. "Saban Brands". Archived from the original on June 22, 2013. Retrieved May 30, 2013. ^ "TV Kids Digital Edition: October 2012 (Page 91)". WorldScreen. Archived from the original on 2012-10-01. ^ "RangerCrew on Twitter: "Digimon Fusion season 2 coming to NickToons next year @licensingexpo"". Twitter.com. 2014-06-16. Archived from the original on 2015-02-16. Retrieved 2015-05-24. ^ a b "Digimon's New Anime Titled & Dated: Digimon Xros Wars in July". Anime News Network. April 17, 2010. Archived from the original on April 21, 2010. Retrieved April 19, 2010. ^ "Staff" (in Japanese). TV Asahi. Archived from the original on 2013-01-11. Retrieved May 22, 2018. ^ "Interview with Digimon Xros Wars' Writer Riku Sanjou". Jefusion. October 2011. Archived from the original on December 14, 2011. Retrieved May 20, 2018. ^ "Crunchyroll to Stream Digimon Xros Wars Anime". Anime News Network. November 2, 2011. Archived from the original on June 20, 2017. ^ "Digimon Fusion Battles premiere in Malaysia". Youtube.com. Archived from the original on 2014-05-23. Retrieved 2014-02-21. ^ Crowe, Deborah (September 25, 2012). "Saban Brands Acquires Digimon Anime Brand". Los Angeles Business Journal. Archived from the original on September 27, 2012. Retrieved September 26, 2012. ^ "Saturday Morning Cartoons Are Gone, A Nation Weeps". Refinery 29. Archived from the original on 12 October 2014. Retrieved 11 October 2014. ^ "Digimon Fusion: Llega a Cartoon Network en Mayo". ANMTVLA. Archived from the original on 2014-03-27. Retrieved 2014-03-24. ^ "Digimon Fusion - ITV Player". itv.com. Archived from the original on 2014-03-16. Retrieved 2014-04-02. ^ "デジモンクロスウォーズ　01" (in Japanese). Bandai Visual. Archived from the original on May 21, 2018. Retrieved May 21, 2018. ^ "デジモンクロスウォーズ　19" (in Japanese). Bandai Visual. Archived from the original on May 21, 2018. Retrieved May 21, 2018. ^ "デジモンクロスウォーズ DVD-BOX 全79話" (in Japanese). Amazon.com. Retrieved May 21, 2018. ^ None (Actor, Director). "Digimon Fusion: None: Movies & TV". Amazon.com. Retrieved 2015-05-24. ^ "Digimon Fusion Vol. 1 (Folge 01-15 im 3 Disc Set)". Amazon.com. Retrieved 2016-01-01. ^ "digimon | Search | Chaos UK". Uk.chaos.com. Archived from the original on 2015-02-10. Retrieved 2015-05-24. ^ "Digimon Fusion: Season 2". Amazon.com. Retrieved May 21, 2018. ^ "Anime "Digimon Xros Wars" Music Code". CDJapan. Retrieved May 22, 2018. ^ "Anime "Digimon Xros Wars" Music Code 2". CDJapan. Retrieved May 22, 2018. ^ ""Digimon Xros Wars (TV anime)" Music Code 3". CDJapan. Retrieved May 22, 2018. ^ "デジモンクロスウォーズ 1" (in Japanese). Amazon.com. Retrieved May 20, 2018. ^ "デジモンクロスウォーズ 4" (in Japanese). Amazon.com. Retrieved May 20, 2018. ^ "テレビに接続 デジモンクロスアリーナ". Bandai. Retrieved May 21, 2018. ^ "デジモンクロスウォーズ 超デジカ大戦 オフィシャルバインダー". Bandai. Retrieved May 21, 2018. ^ "Digimon Story: Super Xros Wars Blue". GameRankings. Retrieved May 21, 2018. ^ "Digimon Story: Super Xros Wars Red". GameRankings. Retrieved May 21, 2018. ^ "Digimon Fusion CCG". ICv2. October 24, 2013. Archived from the original on December 9, 2015. Retrieved May 21, 2018. ^ "Japan's Animation TV Ranking, March 7-13". Anime News Network. June 23, 2011. Archived from the original on July 2, 2017. Retrieved May 20, 2018. ^ "Latest Digimon Anime Nominated for International Kids Emmy". Anime News Network. January 5, 2013. Archived from the original on February 22, 2018. Retrieved May 20, 2018. ^ "The Summer 2010 Anime Preview Guide Carlo Santos". Anime News Network. July 6, 2010. Archived from the original on April 13, 2018. Retrieved May 20, 2018. ^ "The Summer 2010 Anime Preview Guide Hope Chapman". Anime News Network. July 6, 2010. Archived from the original on November 7, 2017. Retrieved May 20, 2018. ^ "The Summer 2010 Anime Preview Guide Gia Manry". Anime News Network. July 6, 2010. Archived from the original on July 24, 2017. Retrieved May 20, 2018. ^ "Narrating Your Life with Kyle Hebert". Otaku USA. November 13, 2013. Archived from the original on May 14, 2018. Retrieved May 20, 2018. ^ "Monday Memos: Interview with voice actor Ben Diskin". Celindareyesblog. Archived from the original on December 26, 2016. Retrieved May 21, 2018. ^ "Digimon, Old and New: A Review of Childhood". Mediaverum. November 13, 2013. Archived from the original on April 23, 2014. Retrieved May 20, 2018. ^ "Digimon Fusion Season 2 DVD Review". DVDCorner. April 28, 2016. Archived from the original on May 21, 2018. Retrieved May 20, 2018. ^ "DVD Round-Up: 'Nightcrawler,' 'Predestination,' 'Captain Scarlet,' & 'Sailor Moon'". ICv2. February 8, 2015. Archived from the original on May 17, 2015. Retrieved May 21, 2018. ^ "DVD Round-Up: 'Gotham,' 'Homeland,' 'Haven,' & 'Over the Garden Wall'". ICv2. September 6, 2015. Archived from the original on November 19, 2016. Retrieved May 21, 2018. ^ "New On Netflix: Flaked, Captain America, Digimon". CulturedVultures. Retrieved May 22, 2018. ^ "Anime Chat: Why you should watch Digimon on Netflix this weekend". Metro. June 9, 2017. Retrieved May 22, 2018. ^ "Digimon Fusion: Season 1". DVDTalk.com. June 12, 2015. Archived from the original on March 27, 2016. Retrieved May 20, 2018. ^ "Monsters in the Closet – Have we left them there?". Casule Monsters. April 2013. Retrieved May 21, 2018. This page was last edited on 25 March 2019, at 03:23 (UTC).